This year’s annual Ribble Valley Juniors Children in Need night bike ride will take place on Friday 15th November. The ride is a guided night bike ride with a halfway stop for some hot supper and a drink. Entry on the night, £15 per person. Children in need sponsor forms available. – If you get more than £35 sponsorship per entry, your entry fee will be refunded. It isn’t a race, it’s a guided 20 mile ride on quiet rural country lanes at a comfortable pace, an opportunity for families to participate in a charity event together and raise money for Children in Need. The event will be fully marshalled by a mobile road crew & support vehicle who will endeavour to make our passage as pleasant, and an enjoyable experience, in as safe cycling environment as possible. All participants under the age of 18 must have a consent form completed by their parent/guardian. Riders under the age of 16 must be accompanied by a parent or guardian who must take responsibility for them and their actions. 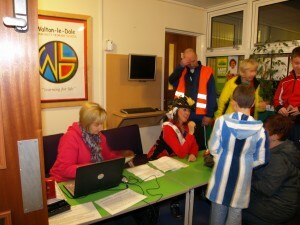 Please download & complete relevant forms prior to the event, to speed up sign in, on the night. The event will be run under British Cycling rules. The ride is approximately 20 miles in total; done at a comfortable pace (it is not a race). All riders must be confident that they can achieve this distance. Roadworthy Bicycle with adequate front and rear bicycle lights. Puncture repair outfit and / or spare tubes. Suitable clothing for the climate. The ride will be led & marshalled by Ribble Valley Juniors Cycling Club. All coaches are British Cycling trained with experienced club marshals doing road duties. We will endeavour to make the ride as pleasant, and an enjoyable experience, in as safe cycling environment as possible. 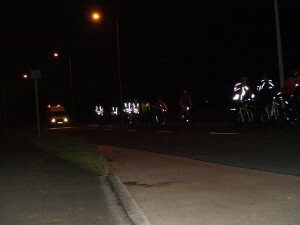 All riders attending must take responsibility for their own actions whilst on the ride. 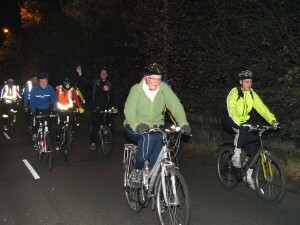 All riders / participants attending the night ride will have to sign an attendance sheet agreeing to the terms & conditions above and that they are on the ride at their own risk and that no actions will bring against Ribble Valley Junior Cycling Club and / or its representatives.